We all go through that revaluation stage as we approach our 30th birthday. Take stock of our lives, wonder what improvements we can make and what dead wood needs to be shed. 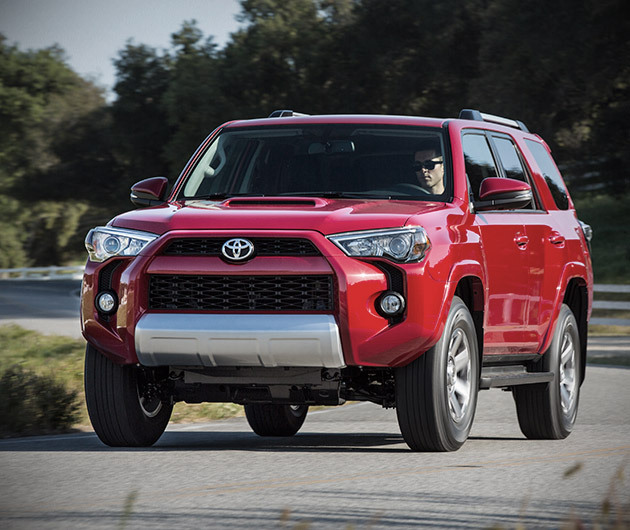 As it approaches its third decade of existence, it seems that even the 2014 Toyota 4Runner is no different. Not that it had that much dead wood to lose, but there are certainly some cool additions. 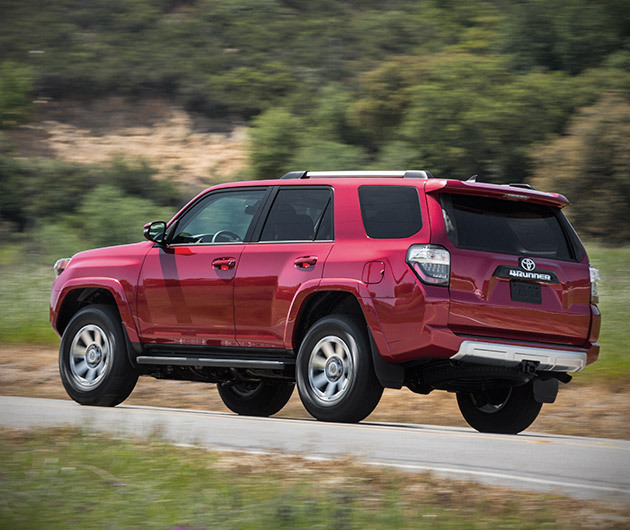 The most rugged of mid-size SUVs has gotten stronger, smarter and sexier to boot. 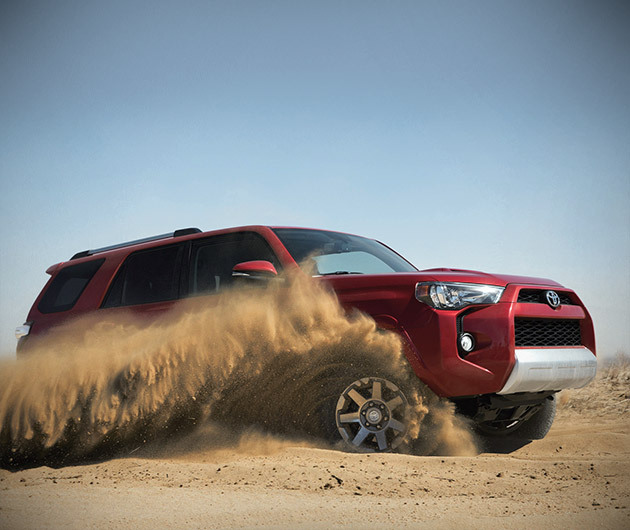 There are three models available: the SR5, the luxurious Limited and the raring-to-go-off-road Trail. You can choose from 4x2 or all-wheel drive and the standard engine is a 4-liter 279HP V6 with an automatic five-speed transmission. Its 278 pounds-feet of torque is optimized by Dual independent Variable Valve Timing with intelligence. Expect 17mpg in the city and four or five more on the highway, depending on your choice of drive. 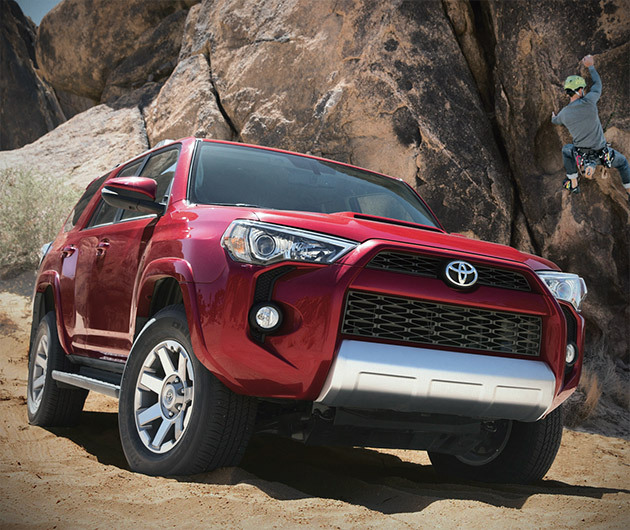 Standard throughout the range is a towbar with a 5,000lb capacity and a roof-rack up top. The double-wishbone independent front suspension, along with variable flow rack-and-pinion steering makes for great handling and the four-link rear suspension makes for a smooth ride too. Opting for the 4x4 means you’ll get the A-Trac system which distributes driving force to any wheel touching the ground, handy for off-road shenanigans. Hill assist comes as standard and for the Trail add the CRAWL and multi-terrain select systems to the list. As for the wheels, the Trail and SR5 ride on 17-inch alloys with an all-new design while the limited boasts 20-inch alloy treads finished in a cool matte black. Up front sits a muscular grille between a pair of smoked headlamps that offer an air of gorgeously majestic menace. You get more bling for your buck with the Limited model, its grille is chrome plated, as are its side moldings, rear bumper and roof-rack. New additions to the 4Runner’s paint-job are Super White, Altitude Black Metallic, Barcelona Red Metallic and Nautical Blue Metallic. It’s equipped with a smart key system, and a 120V outlet and a pair of 12s are fitted as standard. 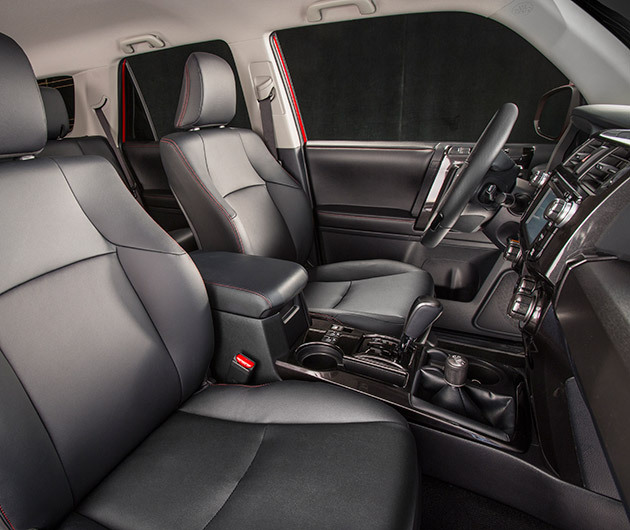 Inside, the SR5 and Trail are furnished with Soft Touch door trim and steering wheel and shift-stick finished in leather. The SR5 also houses a cool highly visible Optitron instrumental panel for the speedometer, tachometer, voltage reader and fuel and temperatures gauges. Its Eco-Driving feedback system allows you to keep track of your consumption while on the go. The Trail has an easy-to-reach overhead console for its off-road controls, along with a compass and outside temperature display. Both the models have standard fabric-trimmed seating while those who opt for the Limited will be rewarded with sumptuous leather. In all three, the second row of seating folds flat. The Trail and SR5 come with the marvellous Entune multimedia system, and premium goodies of the Limited include a 7-inch monitor, 15 speakers and navigation. 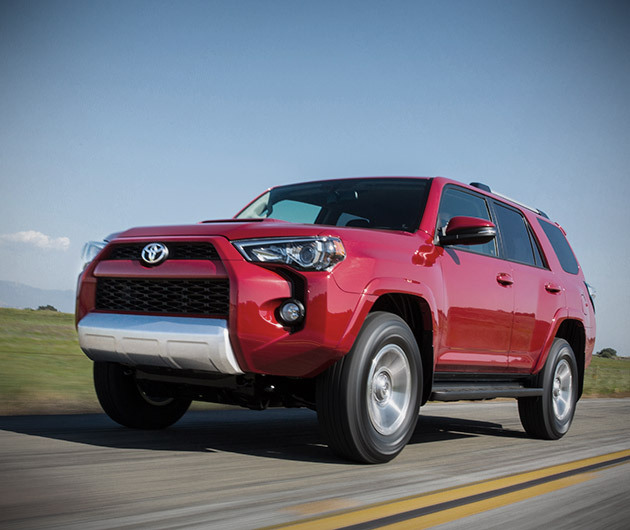 As always, the 4Runner promises to keep you safe with a host of features such as Toyota’s standard Star Safety system with Vehicle Stability Control, anti-lock brakes and brake assist. Eight airbags are fitted as standard, covering you from all directions. Among the Limited’s extras are Automatic Collision Notification, an SOS button, Roadside Assist, and, should you be unfortunate enough to have your brand new gleaming ride pinched, the Stolen Vehicle Location system will track it down in no time.